During this apprenticeship students will learn about Web 2.0 and Social Networks. More specifically, students will learn what it takes to build an online community as well as the design features that include how attract peers an online community. In doing so, students will build a simple website and learn how to add features like games, blogs, surveys, chat forums, pictures and more to a site. The Your Financial Future apprenticeship was created through the collaboration volunteer Citizen Teachers with Bank of America and Citizen Schools. In the apprenticeship, students will learn to speak the language of personal finance in this apprenticeship. They will build an understanding of financial planning and decision making by engaging in tasks in preparation for the WOW! where they will advise three clients on how to develop a financial plan. Along the way they will learn strategies on how to spend and save from financial pros. During this apprenticeship, students will learn about the Design Process. Each lesson will focus on a specific step in the Design Process and will provide students with an opportunity to implement that step. Throughout the apprenticeship, students will meet fictional clients who have hired them to solve various different problems using the Design Process. By the end of the apprenticeship, students will be able to independently use the Design Process to generate original ideas and build a product that suits a specific purpose. The apprenticeship will culminate with students working in pairs to independently implement the Design Process to solve a problem for a fictional WOW! client. Working with the Design Process will give students the tools to approach problems they encounter both in the classroom and in their daily lives. In this apprenticeship students will engage in the engineering process to design, build, test, and revise a solar car according to the specifications set forth by the Junior Solar Sprint (JSS). Students will work in teams to apply their knowledge of solar power, vehicle mechanics, mathematics, and engineering to several iterations of a car design. Each iteration will be improved by rigorous testing and redesigned based on data. By the end of the apprenticeship students will be qualified to compete in the JSS. Some students may actually be able to compete in the JSS while others will compete against each other on campus. This apprenticeship gives students the chance not to take the world as it comes, but make it the way they wish it would be. They will begin to see every aspect of a business not as a “given” but as a choice that the owner made, which they will be equipped to improve on. With the guidance of local business owners, they will learn how to settle upon a successful business idea, create a brand, devise marketing strategies, plan their budget to make a profit, and make a formal presentation to loan officers to “apply” for their start-up loan. Through structured group work, this class builds investment and ownership in shared ideas. “A big part of financial freedom is having your heart and mind free from worry about the what-ifs of life.” - Suze Orman. Yet how can our students experience this freedom from worry when they do not know the basics of how to manage their finances? This apprenticeship teaches the basic terminology and financial management skills critical for students’ development into responsible, money savvy adults. Although this apprenticeship is all about money, students will learn that money is the means to an end not the goal in and of itself. By knowing how to better manage their money, students will be happier and worry less. Through the applied knowledge of budgeting, saving, interest and more, students will be empowered to assist a real client with his/her individualized financial plan at the WOW! and to make smart financial decisions themselves for years to come. Students will conceptualize, organize and implement their own science experiments. At the end of the semester, students will present their experiments and the process of experimentation. Robotics is a rapidly growing field in computer science. This apprenticeship teaches basic robot design to middle school students. Through applied knowledge of computer programming (NXT), research and design, developed problem-solving skills, and intense collaboration with team members, students construct their own basic robots. They also learn to demonstrate knowledge of how and why such robots operate the way they do. Included in this curriculum are explicit connections to career options and educational experiences necessary to fulfilling a career in robotics design. Pencil Code is an exciting apprenticeship where students learn how to create simple computer programs--via Pencil Code--along with the beginnings of CSS and HTML. Students explore coding from the perspective of an artist, engineer, and designer. Each lesson is workshop-based, where students complete tasks outlined on cards, building understanding along the way of how to use, manipulate, and master various programming commands. 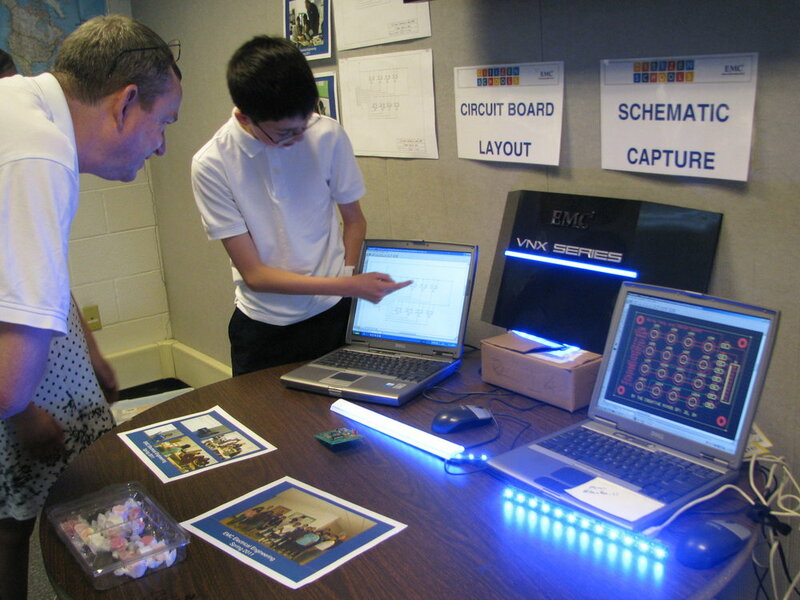 Students create outlined projects and design unique innovations to the projects along the way. Each student creates a WOW! Portfolio of his or her work. Each portfolio features a project demonstrating various skills and showcases a final project of the student’s design that highlights his/ her skills, interests, and creativity. Students in this apprenticeship form business teams, develop products, market their businesses, sell their products, calculate their business costs, revenue, and profit, and donate a percentage of their business profits to a charity of their choice. Through these activities, students learn how they can earn and use money to help those in need in their communities and around the world. This apprenticeship is based on One Hen Academy from One Hen, Inc. -- an enrichment program which evolved from the award-winning children’s book One Hen: How One Small Loan Made a Big Difference by Katie Smith Milway. One Hen Academy students are empowered as financially literate and socially consciousness global citizens, equipped to lead professional productive lives and inspired to help people in need. In an age when anything can be bought at the nearby store or online, the knowledge and skills of how to make things is fading away. In this apprenticeship, students will revive this knowledge and build skills as part of the larger Maker Movement. Students will explore not only different focus areas of Makers (clothing, musical instruments, and simple machines), but also explore different tools commonly used by Makers while learning and practicing the process of innovation. During the last four weeks of the apprenticeship, students will create a final project to address a social issue in their community using the knowledge and skills they have developed in the first six weeks of the apprenticeship. Students will leave this apprenticeship with the confidence and ability to make items they imagine and use the innovation process to explore solutions to everyday problems they may face. In the Life is a Laboratory apprenticeship students will explore 6 scientific concepts over 10 weeks while also learning about how scientific concepts apply to their day-to-day lives. The apprenticeship will focus on building students’ facility with making scientific observations, building and using instruments, then inferences and conclusions based on data. There will be an additional focus on students’ oral presentation skills which they will apply at the WOW! when the class runs a one day science fair where each student will present an experiment from the apprenticeship before an audience of science fair attendees. Robotics is a rapidly growing field in computer science. This apprenticeship teaches basic robot design to middle school students that culminates in a judged competition (WOW!). This competition includes a teamwork interview, research presentation, and a robot demonstration. Through applied knowledge of computer programming (NXT), research and design, developed problem-solving skills, and intense collaboration with team members, students construct their own basic robots and research presentation that result in a unique solution to a problem related to the challenge theme. Students also learn to demonstrate knowledge of how and why such robots operate the way they do. Included in this curriculum are explicit connections to career options and educational experiences necessary to fulfilling a career in robotics design. experimenting with the design process and ultimately building, testing, and presenting a prototype of an innovative product at the WOW!, a designer’s showcase. In the process, they will learn to think like designers as well as learn to empower and support each other as they address issues that are most important to them as young women. Students will become scientists as they design and conduct experiments based on the famed “Diet Coke and Mentos” experiment. Students will present their findings from their experiments to create the biggest soda explosion and explain the science behind their findings. Apprentices will learn about electricity and power through a series of hands-on experiments wherein they will create circuits for flashlights and houses. Apprentices will learn about how electricity flows, what a circuit diagram is, how to wire a circuit in series and in parallel, and how to make an on/off switch. Apprentices will wire the lights in a 3D cardboard box to meet specifications (bright lights, dim lights, switches). In the end, they will design and build an electrical device of their choosing. Inefficiencies, distractions, and time wasted on over complicated tasks are part of the grown-up experience. But do they have to be? In this apprenticeship, students use design thinking to answer this question with a resounding “No!” The lessons in this unit focus on easing the strain of one part of the day, the morning routine! They will promote the kind of thinking that will enable students to design their way out of those inefficient tasks, eliminate distractions, and remove unnecessary complications to everyday tasks. This unit asks students to build things based on a number of RAFT kits which will give students some technical training with physical materials. Students will use the skills learned in these design challenges to develop a solution for a large-scale and relevant challenge: “Design something to solve a problem during morning preparations for school or work." Design is a creative process of setting goals and accomplishing those goals. Using the power of architecture and the design process can help form within each child an underlying structure for learning and creating that will serve every endeavor in their lives: how to define a vision for themselves out of hazy impressions... how to proceed along a path to completion, confident that the vision will result in something of value.